A Cosmopolitan Elena Guillaumin is a Russian born artist who splits her time between residing in France and Scotland. 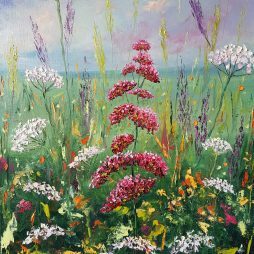 Her main studio is based in the West End of Edinburgh where she brings her artistic inspirations to life! Between the ages of 12 and 15, Elena attended a school of art in Russia but finally oriented her professional life toward business. 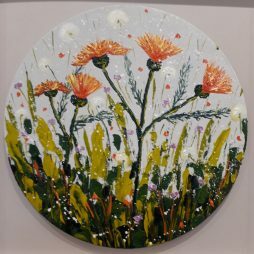 Albeit an interesting and successful career, her need for artistic expression was being unmet and hence she enrolled at the Laoust Art Academy in Paris between 2009 and 2012. Elena was taught at the academy under the direction of Hannah A. Laoust; artist, sculptor, painter and dancer. To this day, the course has been a unique and solid foundation which underpins both her inspiration and creativity and one which has accelerated her present position as an independent artist. 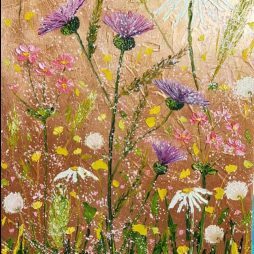 Since moving to Scotland in 2014, Elena’s artwork is strongly inspired by the Scottish landscape; its light, colour and ephemerality. 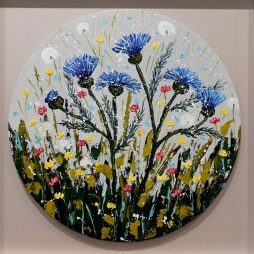 Her artwork represents different scenarios from landscapes to abstract flowers with her recent floral collection being particularly popular with collectors.